Beautiful Wednesday in January in Cozumel. We did a flight to Chichen Itza by Air Plane with 10 enthusiastic passengers of AIDA cruise that docked in Cozumel today. The regular way to go to Chichen Itza from Cozumel is by ferry and then by bus. A long, many hours, and exhausting trip and on top of that you arrive at the hottest moment of the day when the ruins are full of other people. Fly Cozumel does it in a different way. We fly you to Chichen Itza in only 45 minutes. Great info (also in English) about the Mayan ruins in Chichen Itza you will find on the official website (also in English): http://www.chichenitza.inah.gob.mx. As well as on: https://wikipedia.org/wiki/Chichén_Itzá. So how did the trip look like? 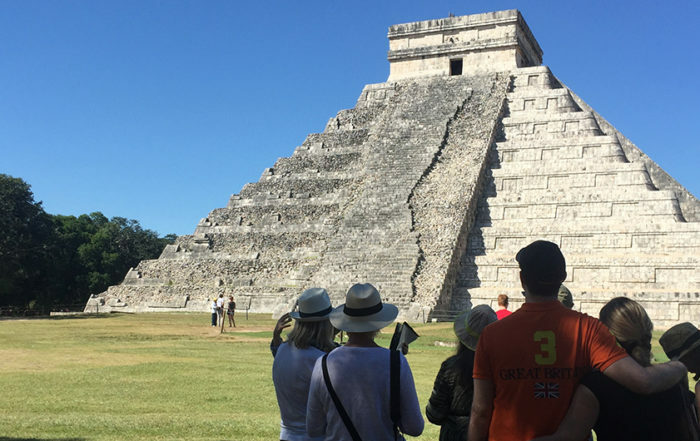 Our guests of today booked the Chichen Itza charter a couple of weeks ago (https://flycozumel.com/easy-rooms/mayan-ruins-chichen-itza-airplane-cozumel-departure/). We picked them up at the pier where AIDA cruise docks in Cozumel and 1 hour later we flew over the Mayan ruins of Chichen Itza. Indeed that easy. The flight was smooth, great visibility and everybody had a good opportunity to take tons of photos of the ruins. On land we reached the ruins and the private guide was ready to to give the 2.5 hour tour. Our guests are from Germany, so we arranged a German speaking guide. At your service! It is a delight to visit the ruins before the crowds arrive, to take pictures of the Mayan Ruins without other people on it. Above all, most of us don’t like to be in the area of the Mayan ruins at the hottest hours of the day. We left Cozumel at 9am sharp and at 10.00am we started our Chichen Itza tour. Then we took the guests to a local restaurant close to the Mayan ruins with some typical food (and drinks, jeje) from Yucatan. Then it was time to go back to Cozumel. The short flight (45 minutes), made it possible to add some shopping in Cozumel before getting back on the Aida cruise. So all and all what a great day. Regularly we post pictures of the Chichen Itza Charters on our Facebook page (https://www.facebook.com/FlyCozumel/) and also on Instagram (https://www.instagram.com/flycozumel/ ). Thank you friends from the AIDA cruise for choosing the Chichen Itza Charter by Airplane from Cozumel by FlyCozumel. See you next year!